This is the earliest known piece written specifically for CUA. One reference said that the students would march through Brookland after victorious games singing this song and then build celebratory bonfires. This song includes thelines, "Hurl the pigskin 'cross the chalk-lines" and "Let Brookland town rejoice tonight." From The Tower, April 29, 1925: "Included in tonight's program will be two special features. One of these headliners will be a clever surprise act and one that the committee feels sure will be fully enjoyed by all those present. The other will be a revival of the famous C. U. song, "Through the Town." Both the words and music of this march were composed by C. U. men, Jimmy Connolly (sic) and Clem Fenton. Its first appearance was made in the Cardinal of 1915 and, although, both the verse and the chorus made a great hit, the verse was dropped soon after for some reason or other and now, all that remains of this collegiate melody is our present favorite, "Up With a Shout." The orchestra will play this song in its entirety and, thus, the students will be given a chance to appreciate the real value of this original C. U. piece of music." The Tower reproduced the engraved score, which was in an abbreviated notation, twice. The first printing was on March 17, 1926, and included the front cover with the authors pictured around a piano along with Tom Stapleton, who introduced the song. By this point, ten years out from the work's composition, only the chorus of the work was known, as it was sung at sporting events (football?). The narrative reads: "Do you know where our 'Up With a Shout' came from? Here's the original song of which it was the chorus. 'Through the Town,' written in 1916 by Conlin and Fenton, both of the Class of '16, is one of the interesting links in the chain of C.U. songs. It is a well-known fact that student songs of any University express the sentiments and traditions of the students at that particular period in the school's development. 'Through the Town' was written at a time when school spirit was just being developed at C.U. ; at a time when the student body was quite a bit smaller than it is at present, and bonfires, street parades, and similar demonstrations were the order of events. The University has progressed since then. The student body no longer marches through Brookland after the big game, for that action is now impracticable. But the spirit is still here, and it is certainly time that this spirit, in its modernized form, found expression in a new C.U. song. For this reason, The Tower is considering all suggestions, words, and melodies for a real C.U. athletic song which can be used for all events, and which will express the spirit of the C.U. of today. Let us add another link to the traditional chain of Catholic University songs, of which 'Through the Town' is a worthy representation." 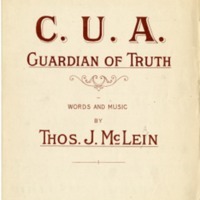 It was printed again on April 4, 1930, with this narration: "This is the song The Tower is trying to make the true C.U. Marching Song. This music will be played at the Supper Dance tomorrow night. It is our purpose to have this song played with a marching swing. The officials of the dance have been communicated with and have promised their cooperation. Make the song go. Sing it!" Performed by Rachel Barham, Thad Garrett, Alex Wolniak, and James Rogers with Andrew Simpson on piano.